Of course muffins can be served as any time snacks. But we love to have them for our brekkie. Quick and easy banana walnut muffins with some chocolate chips added. 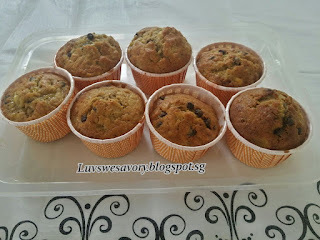 Ain't get enough of these nutty aromatic sweet banana muffins to kick start the day. 75g unsalted butter, melted and cooled. Preheat the oven to 180ºC. Position the rack in the middle. The temperature of the oven may vary, do adjust the temperature and timing to suit your oven. 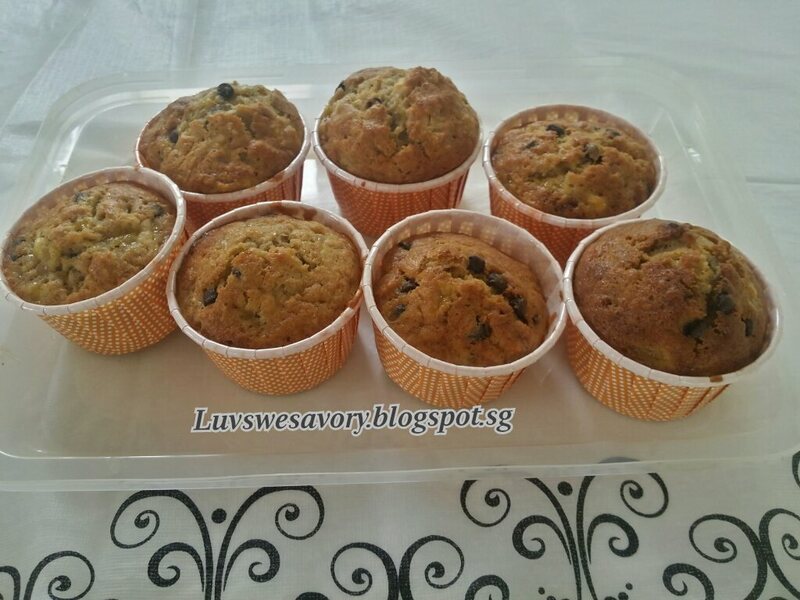 Line a 12 muffin pan with paper liners or use individual muffin cups. In a small saucepan, melt the butter and set aside to cool. In a large bowl combine the dry ingredients A. With a rubber spatula or wooden spoon, lightly fold the wet banana mixture into the dry ingredients A just until combined. (The important thing is not to over mix the batter. You do not want it smooth. Over mixing the batter will yield tough muffins). Quickly fold in the dry ingredients B.
Spoon the batter into the prepared muffin cups. Bake at 180°C for 20-25 minutes or until a toothpick inserted in the center comes out clean. Cool on a rack or serve warm. Chocolate, banana and walnut are such a classic combo. I can snack on them all day long. These muffins look delicious Karen, love this classic combo! Great items for breakfast, tea and snacks. Yums! Perfect with a cuppa of black coffee ! Hi Karen! Banana muffins are my favorite and they are perfect with walnuts and chocolate chips. Hi Karen! This is such a classic and delicious combination that I would love to eat everyday! Mmmm...mmm! I can imagine the aroma, Karen. Your home must smell heavenly. What I would give to have a taste. Banana and walnuts, a great combo! Delicious results!